October 11, 2018 at 12:01a.m. Photo by William D. Lewis | Marvel character Black Panther entertains a group of children of Youngstown Air Reserve Station personnel, who assumed their own poses with stunt men and women starring in Marvel Universe LIVE! Age of Heroes cast this weekend at Covelli Centre Youngstown. The Marvel heroes were at the air base Wednesday. POW! WHAM! SLAM! OOF! AARGh! These are words used by children more than a half-century ago to emulate sounds of the action in comic books just as they shouted “bang” when they used their index finger to shoot the bad guys. 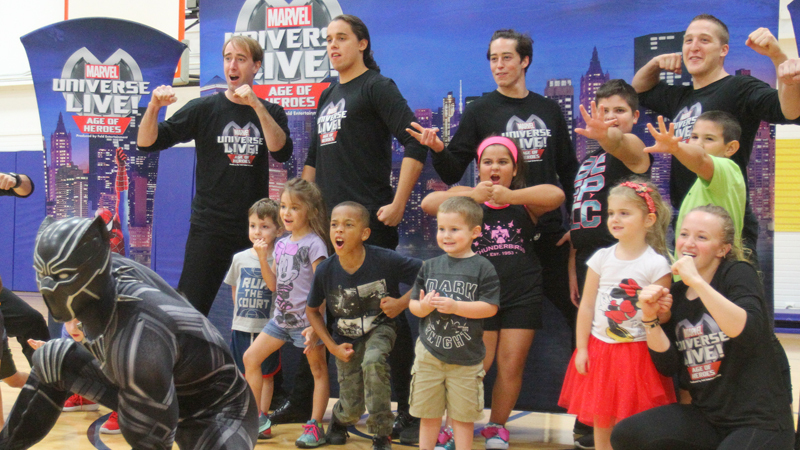 Marvel Universe LIVE characters gave children at Youngstown Air Reserve Station a taste of what is like to be a superhero. Those children, now parents and grandparents, either formed a lifelong fascination of comics as they evolved or are being introduced by their children and grandchildren to a new electronic form of comics that have sound effects and have good guys with unheard-of powers and nearly unstoppable evil bad guys. On Wednesday, about 15 local children of military personnel and civilian employees at the Youngstown Air Reserve Station got a rare, participative behind-the-scenes preview of modern comics brought to life by members of the Marvel Universe LIVE! Age of Heroes cast, which is performing six shows at the Covelli Centre in Youngstown this weekend. According to the USO of Northern Ohio, sponsor of the private showing along with Feld Entertainment, producer of Marvel Universe LIVE!, the show depicts a live battle to defend the universe from evil. The Avengers, the Guardians of the Galaxy and Spider-Man join forces with Doctor Strange, master of the mystic arts, in a race against time to recover the Wand of Watoomb before it falls into Loki’s hands. Loki is the evil brother of Thor, god of Thunder and an Avenger. What the kids enjoyed and enthusiastically participated in at YARS were superhero warm-up exercises, how to properly and safely execute staged and choreographed punches and throws, and practicing superhero poses before a choreographed routine in which Black Panther defeated two other fighters. Tyler Hubbard of Tweksbury, Mass., who has been doing stunt work in movies and on television for several years, including 18 months with Marvel playing Star Lord from “Guardian of the Galaxy,” a good guy trying to save the universe. Hubbard said all cast members are highly trained so injuries are rare. Mistakes can happen, however. While showing Brendon Ballard, whose ninth birthday was Wednesday, how to throw fake punches, he miscalculated and hit one of the stunt men, who managed to keep his smile, in the jaw. To be fair, Brendon, son of Staff Sgt. Lacey Harris with the security force at YARS, was accurate on two other punches. The children of Master Sgt. Scott Obermiyer and his wife, Micki, Michael, 11, and Madison, 9, both said they are big fans of Black Panther. “The base is really great about having family activities. I loved the show,” Micki said. One thing for sure, the kids know their super heroes. May 22, 2017 12:05 a.m.
July 24, 2018 12:22 p.m.
July 25, 2018 12:05 a.m.
October 11, 2018 9:06 a.m.